Rome wasn’t built in a day, but it was burned down in a few hours. Just as Theresa May’s Brexit deal – two years in the making – appears to be unravelling as I write this. Two members of the Cabinet and three junior ministers have resigned, including the Brexit Secretary, and the hard-Brexiteer wing of the Conservative Party are openly mobilising to topple the Prime Minister. Theresa May will need a small miracle to get her deal – or her leadership – through this week intact. As transfixing and important as these minute-by-minute developments are, what comes next will also depend upon the Opposition. With Tory rebels emboldened, the DUP angry, and the Government’s majority effectively gone, it may be the votes of Labour MPs, and the decisions of Labour’s frontbench, that determine what happens next. So, it is worth taking a look at exactly where Labour stands on Brexit, both officially and in practice, and whether it is Jeremy Corbyn, or Shadow Brexit Secretary Keir Starmer, who are really steering Labour on this issue. The first thing to understand is that Jeremy Corbyn’s overriding priority is to leverage the current chaos into forcing a General Election. The argument over Brexit is, he believes, his best shot at getting into Number 10. He may well be right. But this calculation has pitted Jeremy Corbyn against many of his own supporters and his MPs. Corbyn wants a Labour government to deliver Brexit instead of the Conservatives. Starmer wants a second referendum, to overturn Brexit entirely. But Labour policy on Brexit is a pyramid of ‘Ifs’, big enough for both Corbyn and Starmer to occupy at once. The policy agreed at conference says: If the Brexit deal fails to meet Labour’s six tests (we already know it doesn’t meet them), then Labour will vote against the deal; if the Government tries to push for a no-deal Brexit, Labour will also reject that; if Parliament votes down the deal, or the talks end in no-deal, Labour will try to force a General Election; if Labour fails to get a General Election, then ‘all options remain on the table, including campaigning for a public vote’. And maybe, just maybe, one of the options on that hypothetical ballot paper may be to remain in the EU. As unlikely as that seems, the past three years have shown that stranger things can happen. The vagueness of this position is as much an example of Labour’s carefully-cultivated ‘constructive ambiguity’ on Brexit, as it is the consequence of cutting and pasting 150 different motions into one patchwork text. 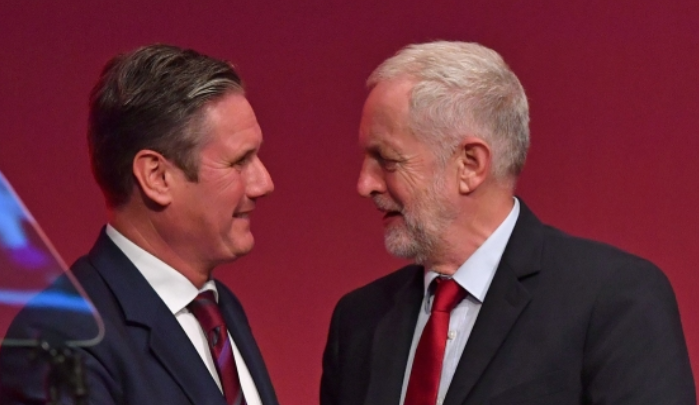 Starmer himself spent four hours locked in a room in Liverpool with 300 frustrated, hungry delegates, to hammer out a compromise that would satisfy the conference without cornering the leadership. It also gave Starmer the chance for his own victory lap, winning a standing ovation when he told the conference “nobody is ruling out Remain as an option” in a second referendum. Starmer has repeatedly directly contradicted his boss on Brexit since, and his stock with Labour members has risen. As an ambitious man, Starmer knows how important this issue is to Labour’s rank and file. In a different age, these bold, public disagreements would have seen the Shadow Brexit Secretary demoted rapidly to the backbenches, but his popularity has made him practically irremovable. All this sets Starmer and Corbyn on a dramatic collision course over the coming weeks, just as the dust settles from the bombshell resignations, as arguments over abstract policy position turn into real choices, and as Tory rebellions mean Labour’s votes in the Commons start to matter more and more. As a result, Labour’s own internal battle may well end up deciding the future of Britain’s relationship with the EU – whether Labour is in government or not.